Alright, gleeks, here’s the scoop: the Glee panel at this year’s PaleyFest had the biggest crowd the Paley Center had seen for a panel in 27 years. WOW! I wish I could’ve been there because not only was the majority of the cast and crew in attendance, but they also aired a director’s cut of episode 14, “Hello.” Amazing! As a result, there are now a lot of spoilers circulating the web, both about “Hello” and about plot lines from upcoming episodes. Now I know that gleeks can be rather divided on the issue of spoilers, so here’s how I’m going to tackle this: Below, I will recount the spoilers and tidbits from the panel discussion. I will not recount spoilers from “Hello,” but if you do want to read a full (albeit choppy) synopsis, you can read one here on Glee Forum. Read on below the jump for the spoilers, and some photos of your favourite gleeks from the event as well (you can always scroll past the spoilers to get to all the pics)! Will and Neil Patrick Harris’ character will share not one but two songs in his upcoming guest appearance! One of the songs will be Aerosmith’s “Dream On” and the other will be a song by Billy Joel (which I think will suit both of their voices extremely well). One episode in the back nine will be themed around the power of theatricality as a small tribute to Lady Gaga. Apparently she loves the show and has given them the rights to use any of her songs. As has been previously reported, Rachel and Puck will get back together briefly in the back nine, although it apparently won’t last for long because there are plans to have Puck show off just how much of a player he can be. Ryan Murphy said in the panel that Puck will get it on with the majority of the show’s female characters! It seems that Kurt’s still pining after Finn in the back nine, and his methods have gotten even more sneaky and deceptive. 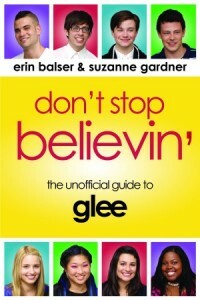 In the upcoming episodes Kurt will try to get his dad and Finn’s mom to date so that he can get closer to the glee stud. Kristin Chenoweth’s return appearance as April Rhodes will be in the third episode back, episode 16. The lovely Jenna Ushkowitz in a hot pink number. Kevin McHale in a dress shirt and trousers…and then a pull-over sweater you wear to the beach? Jayma Mays looking adorable as always. Cory Monteith cleans up very well! Dianna Agron always wears the cutest outfits. I have no idea what was up with the beanie on his head, but Matthew Morrison looked great aside from that! Jessalyn Gilsig, you are one stylish lady! I’m glad that Mark Salling is dressing it up a bit with a blazer nowadays! Jane Lynch is a perennially classy woman. Chris Colfer, you are too cute for words.